Explain how the ethical dilemmas B2B marketers face differ from the ethical dilemmas B2C marketers face. Outline the measures companies take to encourage their employees and executives to act in ethical ways. It’s likely that every topic we have talked about so far in this chapter has an ethical dimension to it. Take procurement, for example: unlike B2C markets, offering customers free dinners, golf games, and so forth is very common in B2B settings. In many foreign countries, business and government buyers not only expect perks such as these but also actually demand bribes be paid if you want to do business with them. And firms pay them, even though some countries prohibit them. (The United States is one such country.) Which countries have a penchant for bribery? In a report called the “Bribe Payers Index,” Transparency International, a watchdog organization, annually ranks the likelihood of firms from the world’s industrialized countries to bribe abroad. The top five countries are shown in Table 4.3 “Transparency International’s Bribe Payers Index”. Source: “Emerging economic giants show high levels of corporate bribery overseas,” Transparency.org, London and Berlin, 2008. http://www.transparency.org/whatwedo/pub/bribe_payers_index_2008 (accessed December 7, 2009). Or take, for example, the straight-rebuy situation we discussed earlier. Recall that in a straight rebuy, buyers repurchase products automatically. Recently, Dean Foods, which manufactures the Silk brand of soy milk, experienced a lot of negative press after the company changed the word “organic” to “natural” on the labels of its milk, and quietly switched to conventional soybeans, which are often grown with pesticides. But Dean didn’t change the barcode for the product, the packaging of the product, or the price much. So stores kept ordering what they thought was the same product—making a straight rebuy—but it wasn’t. Many stores and consumers felt as though they had been duped. Some grocers dropped the entire Silk lineup of products (Waters, 2009). What Dean Foods and Intel did might strike you as being wrong. However, what is ethical and what is not is often not clear-cut. Walmart has a reputation for using its market power to squeeze its suppliers for the best deals possible, in some cases putting them out of business. Is that ethical? What about companies that hire suppliers abroad, putting U.S. companies and workers out of business? Is that wrong? It depends on whom you ask. Some economists believe Walmart’s ability to keep costs low has benefited consumers far more than it has hurt the suppliers of products. Is it fair to prohibit U.S. companies from offering bribes when their foreign competitors can? Clearly, people have very different ideas about what’s ethical and what’s not. So how does a business get all of its employees on the same page in terms of how they behave? Laws and regulations—state, federal, and international—are an obvious starting point for companies, their executives, and employees wanting to do the right thing. The U.S. Federal Trade Commission (FTC) often plays a role when it comes to B2B laws and regulations. The FTC regulates companies in an effort to prevent them from engaging in unfair trade practices that can harm consumers and hamper competition. Further, companies that sell to the government must, by law, follow very strict ethical guidelines. These companies tend to make such guidelines their policy because it is easier to make sure that the federal regulations are followed all of the time than only when selling to the government. Companies are also adopting ethics codes that provide general guidelines about how their employees should behave. Many firms require employees to go through ethics training so they know what to do when they face tricky ethical dilemmas. Large corporations have begun hiring “chief ethics officers” to ensure ethics are properly implemented within their organizations. 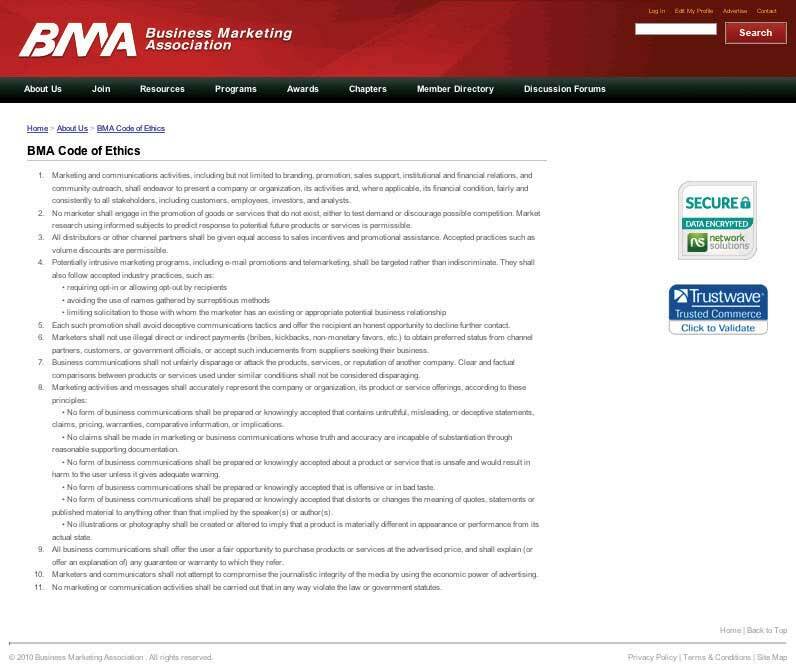 The Business Marketing Association has also developed a code of ethics that discourages bribery and other practices, such as disparaging a competitor’s products unfairly, and encourages treating one’s suppliers equitably. As for Walmart, you can’t fault the company’s procurement practices. Walmart’s purchasing agents aren’t allowed to accept a lunch, dinner, golf game, or so much as a cup of coffee from potential vendors. Walmart is not the only company to have implemented such a policy. More and more firms have followed suit because (1) they realize that perks such as these drive up product costs and (2) they don’t want their buyers making decisions based on what they personally can get out of them rather than what’s best for the company. All things equal, companies want to do business with firms that are responsible. They don’t want to be associated with firms that are not. Why is this important? Because that’s what consumers are increasingly demanding. A few years ago, Nike and a number of other apparel makers were lambasted when it came to light that the factories they contracted with were using child labor and keeping workers toiling for long hours under terrible conditions. Nike didn’t own the factories, but it still got a bad rap. Today, Nike, Inc., uses a “balanced scorecard.” When evaluating suppliers, it looks at their labor-code compliance along with measures such as price, quality, and delivery time. During crunch times, it allows some Chinese factories latitude by, for example, permitting them to adjust when employees can take days off (Roberts, et. al., 2006). Similarly, Walmart has developed a scorecard to rate its suppliers on how their packaging of products affects the environment (Arzoumanian, 2008). Walmart does so because its customers are becoming more conscious of environmental damage and see value in products that are produced in as environmentally friendly a way as possible. Ethics come into play in almost all business settings. Business-to-business markets are no different. For example, unlike B2C markets, offering customers perks is very common in B2B settings. In many foreign countries, government buyers demand bribes be paid if a company wants to do business with them. Understanding the laws and regulations that apply to their firms is an obvious starting point for companies, their executives, and employees in terms of knowing how to act ethically. Companies are also adopting ethics codes that provide general guidelines about how their employees should behave, requiring their employees to go through ethics training, and hiring chief ethics officers. Companies want to do business with firms that are responsible. They don’t want to be associated with firms that are not. Why? Because they know ethics are important to consumers and that they are increasingly demanding firms behave responsibly. Name some of the types of ethical dilemmas facing firms in B2B markets. Why is it difficult for employees and firms to know what’s considered to be ethical behavior and what is not? Arzoumanian, M., “Wal-Mart Updates Scorecard Status,” Official Board Markets 84, no. 46 (November 15, 2008): 1, 4. Roberts, D., Pete Engardio, Aaron Bernstein, Stanley Holmes, and Xiang Ji, “How to Make Factories Play Fair,” BusinessWeek, November 27, 2006, http://www.businessweek.com/magazine/content/06_48/b4011006.htm (accessed December 13, 2009). Waters R. and Nikki Tait, “Intel Settles Antitrust AMD Case for $1.2 Billion,” Financial Times, November 13, 2009, http://www.ft.com/cms/s/0/789729c2-cff4-11de-a36d-00144feabdc0.html (accessed December 13, 2009). 4.6 Ethics in B2B Markets by [Author removed at request of original publisher] is licensed under a Creative Commons Attribution-NonCommercial-ShareAlike 4.0 International License, except where otherwise noted.